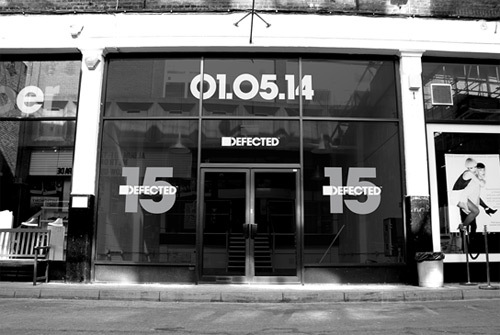 This year Defected reaches its epic fifteenth anniversary. In celebration of this milestone they’ve opened their first-ever record and fashion store. This’ll be complimented with a 15 city global club tour. The label – founded in London 99‘ – has had a massive impact on the global house music scene, as well as garnering an army of dedicated followers. The celebrations kicked off on 01 May, with the opening of a pop-up store and exhibition space in Shoreditch. Defected Records allows visitors exclusive access to its catalogue of music, past and present. Stocks of limited edition original releases from the label’s archives, in both vinyl and CDs formats, will also be unearthed for visitors to buy or sample at the Pioneer listening points. Members of the defected family – some of the worlds best DJs, producers and artists – will be making appearances and hosting a series of talks and workshops. Fans unable to visit the pop-up store in person fear not! May also sees the launch of the online ‘D Store’. This offers a full music download service as well as Defected fashion apparel and accessories.